As this event takes place in three different locations, there are separate websites for each, at which you can register and read more about each event. You may register for one, two, or all three events, but please do so via the individual webpages. 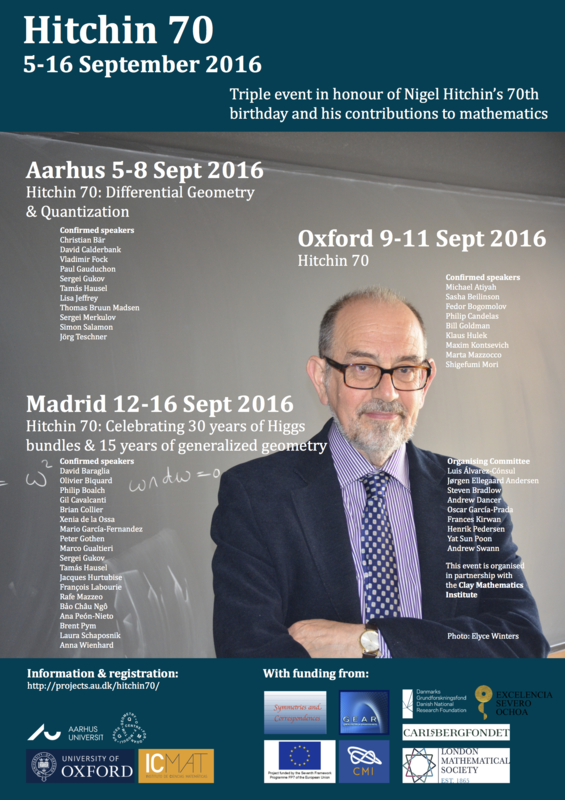 The workshops in Aarhus and Madrid will provide a unique opportunity for researchers and current PhD students to learn about recent exciting developments and exchange ideas in some of the areas most closely associated with Hitchin's name and most influenced by his work. The speakers at the Oxford event will include towering figures in mathematics whose own research has been influenced by Hitchin's. Participants requiring accommodation may book college rooms directly with Balliol and St. Hugh's colleges. Please note availablity is limited and will be allocated on a first come, first served basis. As part of their generous support for this event, the London Mathematical Society is providing funding to help up to 20 UK-based research students attend the meeting. LMS support is for research students studying at universities in the UK who do not have other means of suppot (for example, from Doctoral Training Awards). To apply for this financial support, please email Naomi Kraker and include a brief letter of reference from your academic supervisor. Deadline for financial aid applications is 1 July 2016. The London Mathematical Society administers a Childcare Supplementary Grant for parents working in mathematics who might otherwise be unable to attend conferences and research meetings due to childcare costs. Further information about this scheme can be found on the LMS website.